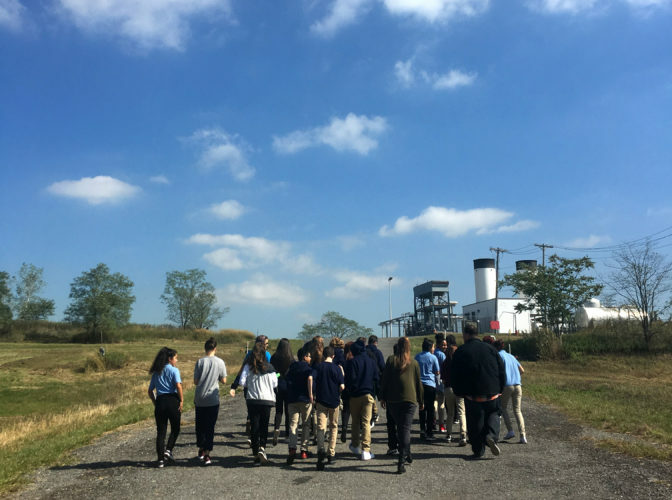 Field trips offer students the unique opportunity to visit sections of Freshkills Park that are currently closed to the public. Because it’s no longer a landfill but not yet a park, the land in these closed sections of Freshkills is at a turning point ripe for education. NYC Parks staff lead groups on a 45-minute nature walk while discussing aspects of Freshkills Park’s history, design and ecology. This is a special opportunity for students to visit sections of Freshkills Park that are currently closed to the public. To ensure the safety of all participants, groups are limited to 30 students. There must be one chaperone for every 15 students. Educators must provide transportation, and that transportation must stay onsite for the duration of the trip. All visitors to Freshkills Park, including educators, chaperones and bus drivers, must sign an Activity Waiver before entering the park. Those under the age of 18 must have a parent or guardian sign the waiver. No visitors are allowed to enter closed sections of Freshkills Park without an activity waiver. Field trips at Freshkills Park take place entirely outdoors and are available on a limited basis. Email freshkillspark@parks.nyc.gov with any questions. Field trips to Freshkills Park are free! However, you are welcome to donate to the Freshkills Park Alliance, which is the nonprofit organization that secures the supplies and equipment necessary for the education program. You can donate here. Is the entire field trip outside? Yes, the both the nature walk and the activities are outside. Because of the elevation and wide open space, the temperature and wind and the park can be more extreme than in surrounding areas. Please prepare students accordingly. On hotter days, tell students to bring water and sun protection. On colder days, advise students to dress in layers. At all times, we recommend sturdy walking shoes. What if there is a chance of bad weather? Field trips will be canceled in the case of inclement weather. If there is a 60% or higher chance of heavy rain, thunderstorms, lightning, or snow, we will cancel the trip by 5pm the weekday before the trip. Can I customize a field trip? At this time, we cannot accommodate custom field trips. If you would like to make sure we talk about a specific element of Freshkills Park, please note this in your field trip request. Are there bathrooms, benches, or picnic areas? Freshkills Park is in transition from landfill to park. At the moment, there are no benches or picnicking areas within closed sections of the Park. There is one bathroom located at the Visitor’s Center, halfway between the entrance and the main activity area. In order to make the most of your time at the Park, we recommend visitors use facilities elsewhere before embarking on their field trip. Is there a good place to eat lunch? School groups are not able to eat lunch in closed sections of Freshkills Park. However, many classes have chosen to eat lunch at Schmul Playground, where there are benches and a comfort station. Schmul Playground is a five minute drive from the exit of Freshkills Park. Upon request, your Freshkills Park educator can lead the group to Schmul at the conclusion of your trip.